The EverDry Modern Drainage System takes care of surface water and the water that enters through cracks in your foundation wall. An inspection trench is dug against the outside wall anywhere the foundation meets dirt. Any cracks identified are sealed to prevent water from entering into the foundation. The system is installed to remove any surface water away from the foundation walls. 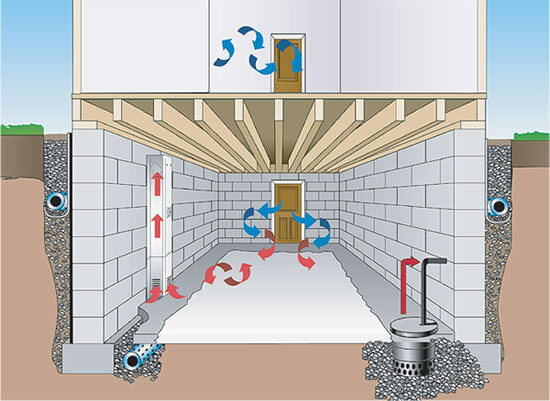 The EverDry Pressure Relief System handles hydrostatic pressure that exist under your basement, which causes water to seep through floor cracks and at the seam where the floor and wall meet leading to lower block water, discolorations and mold. The installation of our Coveplate products or Durashield, depending on the circumstances in your home. Homeowers are shown the progress as changes are made. Financing available through major banks. Free, in-home inspections detect any water-related problems in the foundation or basement.